The controller pattern means that much of the functionality in OpenShift Dedicated is extensible. The way that builds are run and launched can be customized independently of how images are managed, or how deployments happen. The controllers are performing the "business logic" of the system, taking user actions and transforming them into reality. By customizing those controllers or replacing them with your own logic, different behaviors can be implemented. From a system administration perspective, this also means the API can be used to script common administrative actions on a repeating schedule. Those scripts are also controllers that watch for changes and take action. OpenShift Dedicated makes the ability to customize the cluster in this way a first-class behavior. The OpenShift Dedicated and Kubernetes APIs authenticate users who present credentials, and then authorize them based on their role. Both developers and administrators can be authenticated via a number of means, primarily OAuth tokens and X.509 client certificates. OAuth tokens are signed with JSON Web Algorithm RS256, which is RSA signature algorithm PKCS#1 v1.5 with SHA-256. Authorization is handled in the OpenShift Dedicated policy engine, which defines actions like "create pod" or "list services" and groups them into roles in a policy document. Roles are bound to users or groups by the user or group identifier. When a user or service account attempts an action, the policy engine checks for one or more of the roles assigned to the user (e.g., cluster administrator or administrator of the current project) before allowing it to continue. All communication channels with the REST API, as well as between master components such as etcd and the API server, are secured with TLS. TLS provides strong encryption, data integrity, and authentication of servers with X.509 server certificates and public key infrastructure. 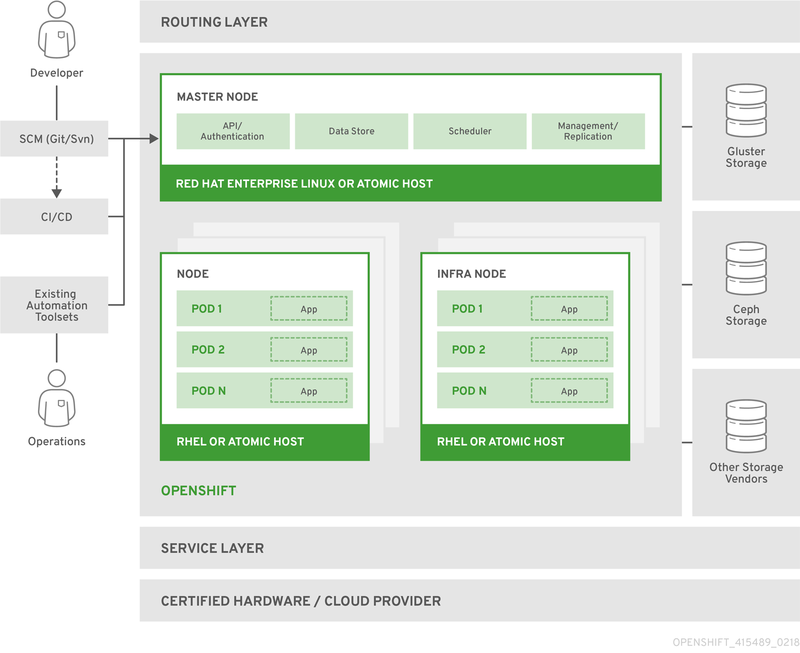 By default, a new internal PKI is created for each deployment of OpenShift Dedicated. The internal PKI uses 2048 bit RSA keys and SHA-256 signatures. OpenShift Dedicated uses Golang’s standard library implementation of crypto/tls and does not depend on any external crypto and TLS libraries. Additionally, the client depends on external libraries for GSSAPI authentication and OpenPGP signatures. GSSAPI is typically provided by either MIT Kerberos or Heimdal Kerberos, which both use OpenSSL’s libcrypto. OpenPGP signature verification is handled by libgpgme and GnuPG. The insecure versions SSL 2.0 and SSL 3.0 are unsupported and not available. The OpenShift Dedicated server and oc client only provide TLS 1.2 by default. TLS 1.0 and TLS 1.1 can be enabled in the server configuration. Both server and client prefer modern cipher suites with authenticated encryption algorithms and perfect forward secrecy. Cipher suites with deprecated and insecure algorithms such as RC4, 3DES, and MD5 are disabled. Some internal clients (for example, LDAP authentication) have less restrict settings with TLS 1.0 to 1.2 and more cipher suites enabled. [a] Disabled by default, but can be enabled in the server configuration. [b] Some internal clients, such as the LDAP client. [c] TLS 1.3 is still under development.